Why can't I borrow against more than 80% of the home's value? Are there different kinds of home equity loans? Can I set up a line of credit with my home equity? How many home equity loans can I have? Why do I have to wait a year to refinance a home equity loan? A home equity loan is a financial product that allows a borrower to use the market value of a home as collateral for a loan. Loans secured by real estate generally are considered safer by lenders, resulting in lower interest rates than for other types of loans. Through home equity loans, Texans can borrow money using up to 80% of the value of their homes as collateral. Consider the example of a home valued at $100,000 with an outstanding mortgage debt of $30,000 and $70,000 worth of equity. Because homeowners are limited to borrowing no more than 80% of the home's value, the homeowner would simply calculate 80% of $100,000 ($80,000) and then subtract $30,000 to arrive at a maximum loan amount of $50,000. Total mortgage debt, including the amount of any existing mortgages plus the projected home equity lien, cannot exceed 80% of the home's current fair market value. Homeowners with 20% or less equity in their homes are not eligible for home equity loans. Texans voted to limit the loan amount to 80% to help prevent overextensions of credit and protect our economy during times of economic slow down. How are home equity loan interest rates determined? Market competition and conditions determine the rates in general; the borrower's own credit history will further affect the rate offered. Home equity loans usually have lower interest rates than do other types of consumer loans, such as loans secured by personal property or loans secured simply by a borrower's signature (unsecured loans). First mortgages (the primary loan on a house) generally have the lowest interest rates. As with any financial arrangement, you should shop around to find the best deal. In the Consumer Assistance section of our Web site are links to some handy online calculators that will help you compare loan programs. Lenders can charge certain fees, usually called closing costs, in addition to interest. On a home equity loan, closing costs cannot exceed three percent (3%) of the principal amount borrowed. Prepaid interest, also known as points, is not subject to the 3% cap. What if I feel a lender has overcharged me on closing costs? 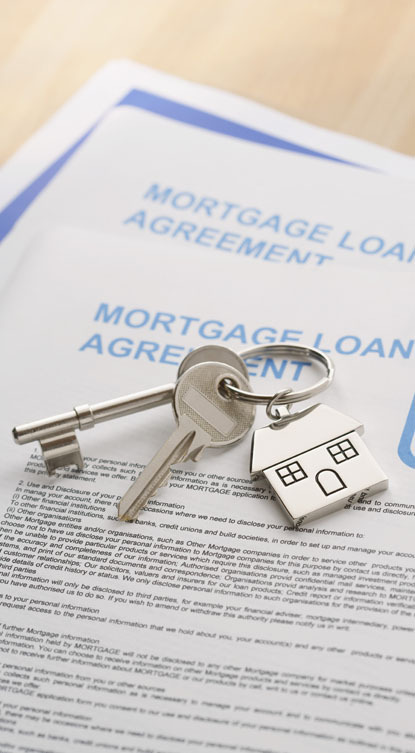 As a savvy consumer, you should always carefully examine a loan agreement before signing it. Have the lender thoroughly explain the contract's fee structure; you'll discover that any points you've purchased are not considered part of the fee amount subject to the three percent limitation. If a lender has overcharged you, you must give the lender a chance to correct the mistake (called curing the loan) before you can take legal action against them. You need to send a written request to the lender specifying the error so that the lender can issue a corrected loan agreement and refund any amounts due. For more information on this process, contact our Consumer Helpline at 800.538.1579 or send your questions to us via e-mail. No, but a home equity loan can hold either first lien or junior lien (often called second) position. If you own your home outright and take out a home equity loan, it will be considered a first mortgage because it is first in line to receive payment if the home is sold or a borrower defaults. If you refinance an existing first mortgage, and pledge some of your equity to receive cash in hand, you will still have just one-but larger-first mortgage. In this loan, generally called a cash out re-fi, the dollar difference between the original mortgage and the refinanced mortgage is the home equity loan amount. A secondary mortgage is a loan secured by a house that already has at least one other mortgage or lien. Taking out a home equity loan in addition to a first mortgage places a second lien against the home. The law prohibits a homeowner from having more than one home equity loan at a time, although a homeowner may have secondary liens from other sources, such as a home improvement loan or a tax lien. As of September 2003, Texans can establish lines of credit using up to 50% of the value of their homes as collateral (as opposed to the 80% allowed on standard loans). However you choose. There are no legal restrictions regarding how you use your loan proceeds. The law requires a 12-day waiting period from the time an application is taken AND a legally mandated written consumer rights notice is given to the borrower. For example, if a potential borrower submits an application on Monday, but doesn't receive a copy of the consumer rights notice until Wednesday, then the 12-day countdown would begin on Wednesday. The 12-day period is measured in calendar days (rather than business days) per the Home Equity Commentary issued by this office. Once the waiting period has passed, the loan can be closed. Further, the homeowner or homeowner's spouse may still cancel the loan agreement without penalty within three days after closing. A borrower may have only one equity loan at a time. Furthermore, it cannot be refinanced more frequently than once a year. Because of this limitation, it is crucial to shop for the best terms among lenders. It is also important, as in any credit transaction, to compare the total costs of a home equity loan to other types of credit available to the consumer. For example, a borrower might not face a prepayment penalty for early payoff of a home equity loan. However, if the loan is paid off early, a home equity loan could end up being more expensive than an unsecured loan with a higher interest rate if you paid closing costs and points. To better determine the best solution to your situation, see the financial calculators in the Consumer Assistance section of our Web site for help crunching the numbers. Why do I have to wait a year to refinance a home loan?